Recent developments in the country's financial markets have certainly been alarming. In itself that is neither unusual nor dangerous. But Turkey's deficit is quite large at 5.5% of national income, or GDP, last year. There are two features of Turkey's foreign debt that also increase its vulnerability. First, it has a high level of debt due for repayment in the near future - loans that have to be repaid and the money borrowed anew. To use the language of the financial markets, the debt has to be refinanced. Credit rating agency Fitch estimates that Turkey's total financing needs this year will be almost $230bn. Second, many Turkish companies have borrowed in foreign currency. Those loans become more expensive to repay if the value of the national currency declines - which it has. 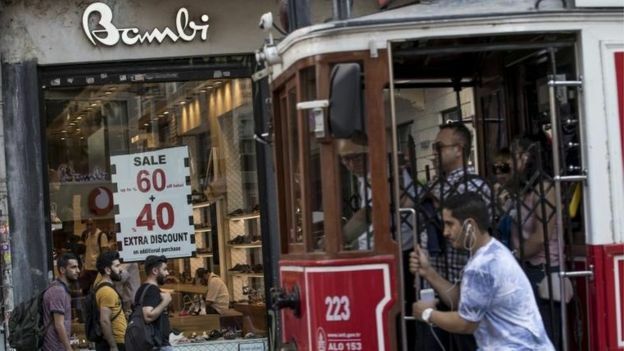 The currency weakness also aggravates Turkey's persistent inflation problem. The weaker lira makes imports more expensive. Financial market investors are also very uneasy about President Erdogan's views on economic policy and the pressure he is seen as exerting on the country's central bank. There is an obvious policy option open to a central bank that wants to bear down on inflation - raising interest rates. That can curb inflation in two ways. 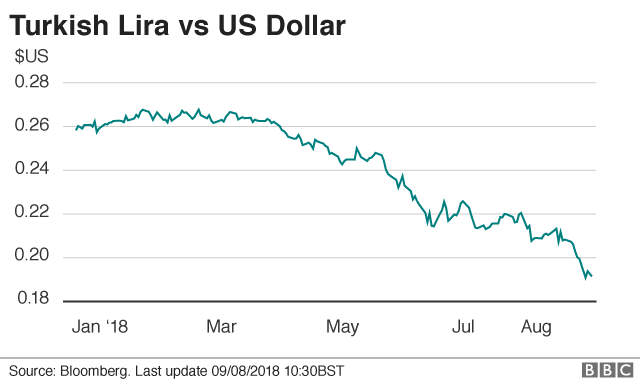 It can weaken demand at home, and by increasing financial returns in Turkey encourage investors to buy lira - which strengthens the currency and reduces the cost of imports. Turkey's central bank has taken several such moves, but without any lasting impact on the problem. What bothers the markets is the president's well known - and most economists would say, ill-informed - opposition to higher rates. He has described himself as the enemy of interest rates. Confidence has been further undermined by Turkey's strained relations with the United States. Turkey has detained an American evangelical pastor and there are differences over the approach to Syria. In addition, the US is reviewing Turkey's eligibility for a programme that gives many exports from developing countries duty-free access to the US market. In some respects the recent performance of the Turkish economy looks reasonable. It has grown every year this century apart from 2001 (the country's last economic crisis when it received an IMF bailout) and 2009 (in the aftermath of the global financial crisis). In some years growth has been very strong. Unemployment is on the high side - the most recent figure is 9.9% - but it has been relatively stable. One important difference compared with the country's crisis at the beginning of the century is that there is now no exchange rate target, unlike in 2001. That said, credit rating agency Moody's says that economic growth has been boosted to unsustainable levels by spending and tax policies. Policies for long-term growth have been sidelined, the agency says, given the focus on election cycles.